We pride ourselves in being a family business; a modern mixed farm with a range of enterprises centred around the production of free range eggs on 70 acres of pasture. We’ve produced eggs for over 30 years so have a long history of working with hens on range and believe we know just what it takes to make them…… happy hens! We also believe that we know how to produce the tastiest eggs! 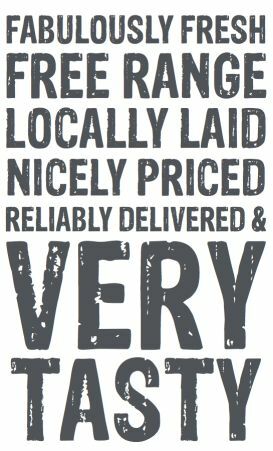 Our many customers, from Michelin Star chefs to the regulars who buy directly from our farm shop, all prefer Stokes Farm eggs. We’ve always maintained that hens are more content in smaller groups, so we rotate five flocks, giving us the egg sizes we need and continuity of supply. Each hen house has plenty of popholes which are opened first thing in the morning so the hens can get on with their busy day. You’ll notice they’re always on the move, pecking and scratching in the grass. Key to the health of our hens is a good diet. We work with our dedicated feed supplier, Humphrey Feeds, to devise unique feed rations that have helped our eggs gain their incredibly tasty reputation. Hens lay an egg on most days and usually in the morning so our first egg collection begins after 8.00 am. Grading and packing follows and then eggs are ready for delivery. Because our customers are supplied directly by our own drivers they are always super fresh when they arrive at their destination.